For other uses, see Pig iron (disambiguation). Pig iron is an intermediate product of the iron industry, also known as crude iron, which is first obtained from a smelting furnace in the form of oblong blocks. Pig iron has a very high carbon content, typically 3.8–4.7%, along with silica and other constituents of dross, which makes it very brittle and not useful directly as a material except for limited applications. Pig iron is made by smelting iron ore into a transportable ingot of impure high carbon-content iron in a blast furnace as an ingredient for further processing steps. The traditional shape of the molds used for pig iron ingots was a branching structure formed in sand, with many individual ingots at right angles to a central channel or runner, resembling a litter of piglets being suckled by a sow. When the metal had cooled and hardened, the smaller ingots (the pigs) were simply broken from the runner (the sow), hence the name pig iron. As pig iron is intended for remelting, the uneven size of the ingots and the inclusion of small amounts of sand caused only insignificant problems considering the ease of casting and handling them. Smelting and producing wrought iron was known in ancient Europe and the Middle East, but iron was produced in bloomeries by direct reduction. Pig iron was not produced in Europe before the Middle Ages. The Chinese were also making pig iron by the later Zhou dynasty (which ended in 256 BC). Furnaces such as Lapphyttan in Sweden may date back to the 12th century; and some in the Mark, Westfalen, Germany to the 13th. It remains to be established whether these northern European developments derive from Chinese ones. Wagner has postulated a possible link via Persian contacts with China along the Silk Road and Viking contacts with Persia, but there is a chronological gap between the Viking period and Lapphyttan. The phase transition of the iron into liquid in the furnace was an avoided phenomenon, as decarburizing the pig iron into steel was an extremely tedious process using medieval technology. Traditionally, pig iron was worked into wrought iron in finery forges, later puddling furnaces, and more recently, into steel. In these processes, pig iron is melted and a strong current of air is directed over it while it is stirred or agitated. This causes the dissolved impurities (such as silicon) to be thoroughly oxidized. An intermediate product of puddling is known as refined pig iron, finers metal, or refined iron. Pig iron can also be used to produce gray iron. This is achieved by remelting pig iron, often along with substantial quantities of steel and scrap iron, removing undesirable contaminants, adding alloys, and adjusting the carbon content. Some pig iron grades are suitable for producing ductile iron. These are high purity pig irons and depending on the grade of ductile iron being produced these pig irons may be low in the elements silicon, manganese, sulfur and phosphorus. 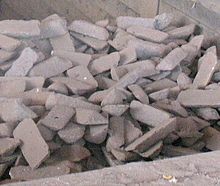 These types of pig iron are used to dilute all the elements (except carbon) in a ductile iron charge which may be harmful to the ductile iron process. 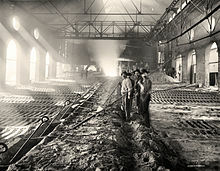 Until recently, pig iron was typically poured directly out of the bottom of the blast furnace through a trough into a ladle car for transfer to the steel mill in mostly liquid form; in this state, the pig iron was referred to as hot metal. The hot metal was then poured into a steelmaking vessel to produce steel, typically an electric arc furnace, induction furnace or basic oxygen furnace, where the excess carbon is burned off and the alloy composition controlled. Earlier processes for this included the finery forge, the puddling furnace, the Bessemer process, and the open hearth furnace. Modern steel mills and direct-reduction iron plants transfer the molten iron to a ladle for immediate use in the steel making furnaces or cast it into pigs on a pig-casting machine for reuse or resale. Modern pig casting machines produce stick pigs, which break into smaller 4–10 kg piglets at discharge. ^ Camp, James McIntyre; Francis, Charles Blaine (1920). The Making, Shaping and Treating of Steel (2nd ed.). Pittsburgh: Carnegie Steel Co. p. 174. OCLC 2566055. Archived from the original on 2015-11-11. ^ SAMUEL THOMAS (September 1899). "REMINISCENCES OF THE EARLY ANTHRACITE-IRON INDUSTRY". TRANSACTIONS OF THE AMERICAN INSTITUTE OF MINING ENGINEERS (reprint by TheHopkinThomasProject.com). Archived from the original on 14 March 2014. Retrieved 5 December 2016. ^ Glossary of Metalworking Terms. Industrial Press. 2003. p. 297. ISBN 9780831131289. Archived from the original on 2017-02-24. ^ The Making, Shaping, and Treating of Steel: Ironmaking volume (PDF). AISE Steel Foundation. 1999. p. 18. Archived from the original (PDF) on 2016-03-04. ^ Several papers in The importance of ironmaking: technical innovation and social change: papers presented at the Norberg Conference, May 1995 ed. Gert Magnusson (Jernkontorets Berghistoriska Utskott H58, 1995), 143-179. ^ R. F. Tylecote, A history of metallurgy (2nd edition, Institute of Materials, London, 1992). Wikimedia Commons has media related to Pig iron.